On November 29, 2003 I purchased a used tandem bicycle from a neighbor. 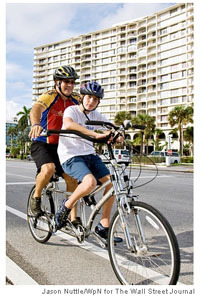 This bike is unique and differs from the typical “child-behind” tandem because the child sits in front; his pedals are fully connected to the gears and his handlebars are on the same bar as the adult’s. I have always been enthusiastic about exercise, and this design seemed perfect for safe and fun cycling with my son, Jesse, who has autism. When Jesse was a toddler, I used to take him in the child seat attached to my bike. However, as Jesse got older we needed an alternative. He enjoys bike riding and even learned how to ride a two-wheeler. Unfortunately, Jesse, like most children with autism and many with related disabilities, does not understand the concept of traffic and stop signs. At first, I purchased a “tag along bike” that attached to my bicycle, and included handlebars and pedals. However, I constantly had to look back at Jesse to make sure he was holding on and pedaling. He was usually not doing one or the other and would often pedal backwards. On more than one occasion I crashed as I was looking back at Jesse. Since 2003, Jesse and I have been riding our special bike together almost every weekend. As Jesse and I enjoyed the bike and received so many smiling looks along the way, I began to think about the many parents and children who could benefit from this design. I contacted the inventor, Robert Gardner, offered to purchase the patent, and in 2005, a Special Needs Irrevocable Trust for the benefit of Jesse (Jesse’s Trust) purchased the rights to the patent for the bicycle as well as the remaining inventory. 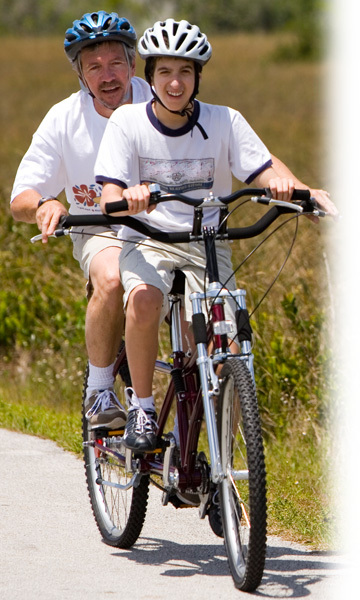 Jesse and I look forward to our weekend routine of riding the Buddy Bike. We spend about 2 hours together as we ride 10 to 18 miles, stop for breakfast and return home. Every once in a while Jesse turns around to look at me with a very big smile on his face. Instead of watching my back as he did with the tag along bike, Jesse now sees an open world with nothing in front of him but road and sky.